Bundaberg is a city in Bundaberg Region, Queensland, Australia. To see other places to visit, traveler tips, and other tourist information, you can read our Bundaberg route builder . Adelaide to Bundaberg is an approximately 7.5-hour flight. You can also do a combination of flight and train; or drive. Expect a bit warmer temperatures when traveling from Adelaide in November; daily highs in Bundaberg reach 34°C and lows reach 22°C. On the 15th (Thu), you're off toPort Douglas. 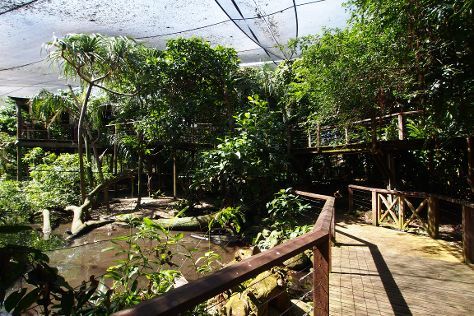 Kick off your visit on the 16th (Fri): tour the water at your own pace with Shaolin Junk Cruises and then tour the pleasant surroundings at Wildlife Habitat Port Douglas. To find traveler tips, maps, ratings, and other tourist information, go to the Port Douglas travel tool . You can do a combination of flight and shuttle from Bundaberg to Port Douglas in 8 hours. Other options are to do a combination of train, flight, and shuttle; or drive. Traveling from Bundaberg in November, Port Douglas is a bit warmer at night with lows of 26°C. Wrap up your sightseeing by early afternoon on the 16th (Fri) to allow time for travel back home.